Barcelona defender Jordi Alba hopes Julen Lopetegui is not sacked by Real Madrid ahead of Sunday's Clasico clash between the sides. 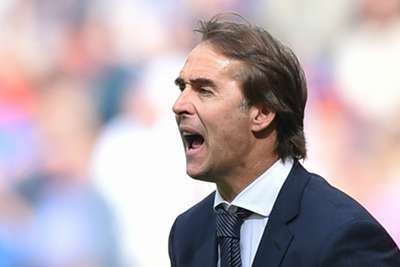 Lopetegui is reportedly on the brink at Madrid following four defeats in their last five matches in all competitions, with the Champions League holders playing Viktoria Plzen next on Tuesday. Alba played under Lopetegui for Spain before the coach was sensationally sacked shortly before the start of the World Cup following the announcement he was to take charge of Madrid after the tournament in Russia. And the left-back gave his backing to under-fire Lopetegui even though Barcelona will face off against Madrid in the first meeting of the fierce LaLiga rivals at the weekend. "All the people made decisions and at that moment Julen wanted to finish the World Cup and sign for Madrid, but then the president of the federation [Luis Rubiales] made the decision that he took," Alba told reporters. "I have a great relationship with him, I have a great love for him because he has helped me a lot and I wish he could stay in the position. "Although I did not like the team he joined, he deserves to continue because he is a great professional." Barcelona top LaLiga going into the Clasico with Madrid lagging four points behind in seventh place. And even though Barca will be without captain Lionel Messi due to a fractured right arm, Alba expects a thrilling encounter at Camp Nou. "I remember winning 4-0 at the Bernabeu and 3-0 there too," Alba said. Alba is in the last two years of his Barcelona contract but the left-back is unsure on renewal talks. "I'm very relaxed and right now I have no information from the club," he added.